Everyone knows that flowers are a traditional symboland are generally preferred as a must-have for weddings. They are beautiful, they put a needed pop of color wherever they’re placed, and they bring freshness and liveliness to a room. The problem is that they can be expensive; from bridal and entourage bouquets, centerpieces, decors, and other little things – the costs can really add up. Enter silk flowers. They are heaven-sent for brides and grooms looking to have a more durable and longer lasting alternative for fresh flowers. Silk flowers may be artificial but nowadays, they are so well-made that they look like real florals. No matter what the reason, there are a lot of benefits to using artificial flowers. When you use real flowers traditionally, they will wilt after a day and will usually be thrown after that which can be wasteful. Wedding decors made with silk flowers will last longer and they can be kept forever as a memento or something to give away to guests. Most people think that silk flowers are cheaper than real ones and the tendency comes from the thinking that artificial equals cheap. It’s not always the case and in fact, they can be more expensive depending on the quality of the silk flowers, the price, and seasonality. When it comes to arrangements, florists tend to charge the same rate, but the major difference is, exclusively artificial flowers can be made way more ahead of time. If you absolutely must have fresh flowers but worried that they may wilt in the heat for your outdoor summer wedding, try incorporating artificial flowers on your bridal and entourage bouquets. Try not to keep everything flower when it comes to bouquets, try adding a splash of green in there somewhere so you won’t use as many flowers real or otherwise. Furthermore, try to be more realistic and work with your limited budget by using fresh blooms that are in season. Silk flowers are also a great alternative if you are set on having out of season and exotic blooms that go perfectly with your wedding theme. One key to having these artificial blossoms looking great in photos and in real life is to set a standard color palette for all things flowers on your special day. Additionally, it doesn’t hurt to go for higher-end faux flowers over the ones with weird water droplets on them that look ultra fake no matter which angle you look at it. There are a lot of ways for silk flowers to look good as centerpieces for your venue tables and the best part is, it can be made way ahead of time. They can be reused for other designs as well. Just like real flowers, personal touches can be added to make them even more beautiful. Silk flowers are versatile and they can be paired with so many other decors: lights, mirrors, colored pebbles, ribbons, candles, and even some leaves. You don’t need to use a lot of them in table centerpieces because a single blossom can be used to add a pop of color or showed off inside a pretty container like a vase, pottery, wooden box, basket, and many more. The good thing is: you can purchase silk flowers onlineby the piece or wholesale, depending on how many you need for your arrangement. A way to save money on centerpieces is to intend them to have multiple uses. They can be your bridesmaids’ bouquets for the first half of the celebration at the actual ceremony and then as centerpieces at the venue. Plan it in such a way that all your bridesmaids have to do is to neatly place their respective bouquets to assigned tables. Truly, there is no limit to imagination and creativity. A floral curtain could make an inviting and romantic entrywayand exit for the newly-made couple. It could also be used as a photo backdrop, or a stylish divider between sections of the venue. Additionally, it can be used as a hanging decoration. Instead of having a floral curtain, consider having a floral and greenery installation. This is an up-and-coming trend in weddings across the country because it looks stunning and makes a good first impression for guests and especially for the bride and groom arriving at the reception for the first time. Silk flowers are great for this kind of arrangement because they won’t wilt like real flowers will and can be prepared in advance. There is a lot more to just tying silk flowers and greens to the ceiling. There is an art to making them dangle overhead. The key is to assign them a specific structure so talk with your florists about what specific arrangement you would like. 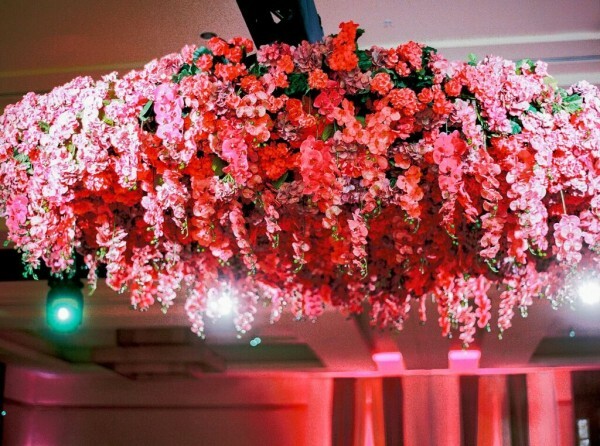 An elaborate hanging floral installation can become a statement piece of your wedding venue. It is known that beautifully-designed and artfully placed floral arrangements can truly transform the overall look of any event including weddings. If you plan to use artificial flowers for all your wedding decors, purchase them weeks in advance so you can have them arranged. Do you have other uses for artificial flowers for weddings? Share your thoughts in the comments below.